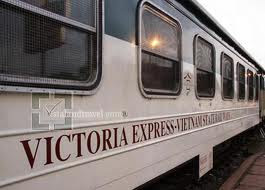 Victoria Express train is the best train in terms of comfort and services from Hanoi to Lao Cai, Victoria "Orient Express" stylish train offers one restaurant and two luxury sleeping carriages, all with air-conditioning. This is not a separate train, but rather part of the normal run between Hanoi and Lao Cai. Victoria Express Train recalls a more romantic era. Passing through the exotic landscapes of North Vietnam, between the charming cities of Hanoi and Lao Cai. Each sleeping carriage has 6 superior cabins (4 berths) and 2 deluxe cabins (2 berths). The Hanoi - Lao Cai train stops at Lao Cai Railway Station, just 40 km from Sapa; in order to reach Sapa, you will need to travel an hour and a half more through a connecting bus or private car. The bus stops at Sapa's main Post Office, leaving you with some minutes walk into town. It can also stop at your hotel, depending upon the location of the hotel. Ticket prices for connecting buses Lao Cai - Sapa are 60000VND or US$3/way. The tourist bus back to Lao Cai leaves from outside Sapa's church, but usually it can pick you up at your hotel. You can inquire with the staff at your hotels for getting a bus ticket back to Lao Cai Railway Station.